Welcome . Please enjoy your stay. 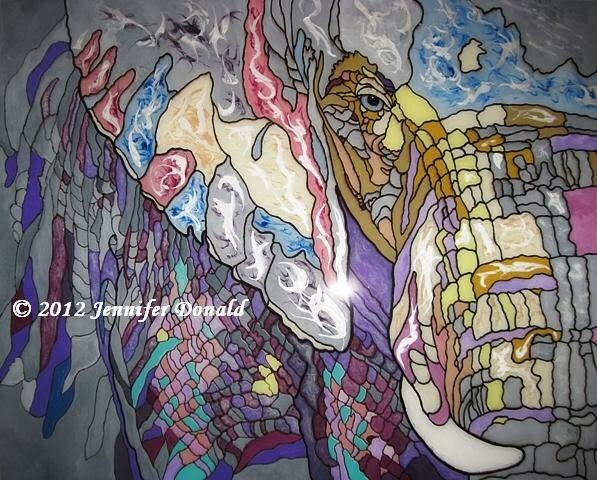 The first in the series, "The Glass Menagerie"
I can only give you a "look-see" of what this painting is, its one you have to see in person and a definite one-of-a-kind. I have been working on an old-time racing painting and got stuck on the technical details of the cars. Since I am not a car person, this got to be very frustrating. I tend to be a bit rigid in my painting style and as someone described me, a "detail nazi". I set the racing painting aside knew I needed a break from the norm and needed to get out of my comfort zone. My friend Melissa makes stained glass sun catchers and ornaments. We were discussing the process and the idea hit me: "Melly, what if you took all the wrinkles in an elephant's skin, and used that as the solder lines for stained glass? Wouldn't that be cool?" The more I thought about it, the cooler it became. I messaged her. I'm going to paint that. I researched my idea (as usual), looking up photos of elephants and also the symbolism with elephants- I knew there HAD to be some meaning there. The elephant has several symbolic meanings: stability, determination, loyalty, responsibility and the one I wanted to focus on, bulldozing through obstacles! The stained glass look of the painting is important to me as well. As an artist, for its beauty and uniqueness, and because even when we feel as fragile as glass, we persevere and Break Through.